But these monsters were not willing to let the child remain behind them; they took him by the hand to drag him along with them, but he was so very unwilling to go, and made such a noise by crying, that they took him by his feet, and dashed his brains out against the threshold of the door. They then scalped and stabbed him, and left him for dead. When I witnessed this inhuman butchery of my own child, I gave a most indescribable and terrific scream, and felt a dimness come over my eyes, next to blindness, and my senses were nearly gone. The savages then gave me a blow across my head and face, and brought me to my sight and recollection again. During the whole of this agonizing scene, I kept my infant in my arms. As soon as their murder was effected, they marched me along to the top of the bank, about forty or sixty rods, and there they stopped and divided the plunder which they had taken from our house, and here I counted their number, and found them to be 32; two of whom were white men painted as Indians. Several of the Indians could speak English well. I knew several of them well, having seen them go up and down the Allegheny river. I knew two of them to be from the Seneca tribe of Indians, and two of them Munsees; for they had called at the shop to get their guns repaired, and I saw them there. We went from this place about forty rods, and they then caught my uncle John Currie's horses, and two of them into whose custody I was put, started with me on the horses towards the mouth of the Kiskiminetas, and the rest of them went off towards Puckety. When they came to the bank that descended towards the Allegheny, the bank was so very steep, and there appeared so much danger in descending it on horseback, that I threw myself off the horse in opposition to the will and command of the savages. My horse descended without falling, but the one on which the Indian rode who had my little boy, in descending, fell, and rolled over repeatedly; and my little boy fell back over the horse, but was not materially injured; he was taken up by one of the Indians, and we got to the bank of the river, where they had secreted some bark canoes under the rocks, opposite the island that lies between the Kiskiminetas and Buffaloe. They attempted in vain, to make the horses take the river. After trying for some time to effect this, they left the horses behind them and took us in one of the canoes to the point of the island and there they left the canoe. Here I beheld another hard scene, for as soon as we landed, my little boy who was still mourning and lamenting about his little brother, and who complained that he was injured by the fall, in descending the bank, was murdered. One of the Indians ordered me along, probably, that I should not see the horrid deed about to be perpetrated. The other, then, took his tomahawk from his side, and with this instrument of death killed and scalped him. When I beheld this second scene of inhuman butchery, I fell to the ground senseless, with my infant in my arms, it being under and its little hands in the hair of my head. How long I remained in this state of insensibility, I know not. 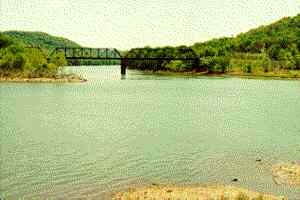 We now proceeded on our journey by crossing the island, and coming to a shallow place where we could wade out, and so arrive at the Indian side of the country. Here they pushed me in the river before them, and had to conduct me through it. The water was up to my breast, but I suspended my child above the water, and with the assistance of the savages, got safely out. In silence we rapidly proceeded forward, and came to Big Buffaloe: here the stream was very rapid and the Indians had again to assist me. When we had crossed this creek, we made a straight course to the Conequenessing creek, the very place where Butler now stands; having first traveled five or six miles to Little Buffaloe, and crossed it at the very place where Mr. B. Sarver's mill now stands, and ascended the hill. I now felt weary of my life, and had a full determination to make the savages kill me, thinking that death would be exceedingly welcome, when compared with the fatigue, cruelties and miseries I had the prospect of enduring. To have my purpose effected, I stood still, one of the savages being before me, and the other walking on behind me, and I took from off my shoulder a large powder horn they made me carry, in addition to my child, who was one year and four days old. I threw the horn on the ground, closed my eyes, and expected every moment to feel the deadly tomahawk. But to my surprise, the Indian took it up, cursed me bitterly, and put it on my shoulder again. I took it off the second time, and threw it on the ground; and again closed my eyes, with the assurance, I should meet death; but instead of this, the savages again took up the horn, and with an indignant frightful countenance, came and placed it on again. I took it off the third time, and was determined to effect it, and therefore threw it, as far as I was able from me, over the rocks. The savage immediately went after it, while the other who had claimed me as his squaw, and who stood and witnessed the transaction, came up to me, and said well done, I did right and was a good squaw, and the other was a lazy son of a b----h; he might carry it himself . . . . The savages now changed their position, and the one who claimed me as his squaw, went behind. This movement, I believe, was to prevent the other from doing me any injury; and we went on till we struck the Conequenessing at the Salt-Lick, about two miles above Butler, where was an Indian camp, where we arrived a little before dark, having no refreshment during the day. The camp was made of stakes driven into the ground sloping, and covered with chestnut bark; and appeared sufficiently long for fifty men. The camp appeared to have been occupied for some time; it was very much beaten and large beaten paths went out from it in different directions. In the morning one of them left us, to watch the trail or path, we had come, to see if any white people were pursuing us. During the absence of the Indian, who was the one that claimed me, the savage who remained with me, and who was the murderer of my last boy, took from his bosom his scalp, and prepared a hoop, and stretched the scalp on it. Those mothers who have not seen the like done by one of the scalps of their own children, (and few, if any, ever had so much misery to endure,) will be able to form but faint ideas of the feelings which then harrowed up my soul!! I meditated revenge! While he was in the very act, I attempted to take his tomahawk, which hung by his side and rested on the ground, and had nearly succeeded, and was, as I thought about to give the fatal blow; when alas! I was detected. The savage felt me at his tomahawk handle, turned around upon me, cursed me, and told me I was a yankee; thus intimating he understood my intention, and to prevent me from doing so again, faced me. My excuse to him for handling his tomahawk was, that my child wanted to play with the handle of it. Here again I wondered at my merciful preservation, for the looks of the Indian were terrific in the extreme; and these, I apprehend, were only an index to his heart. But God was my preserver! The savage who went upon the look-out in the morning, came back about 12 o'clock, and had discovered no pursuers. Then the one who had been guarding me, went out on the same errand. The savage who was now my guard, began to examine me about the white people; the strength of the armies going against them, &c. and boasted large of their achievements in the preceding fall, at the defeat of General St. Clair. He then examined into the plunder which he had brought from our house the day before. He found my pocket-book and money in his plunder. There were ten dollars in silver, and a half a guinea in gold in the book. During this day they gave me a piece of dry venison, about the bulk of an egg, and a piece about the same size, the day we were marching, for my support and that of my child; but owing to the blows I had received from them on my jaws, I was unable to eat a bit of it. I broke it up and gave it to the child. The savage on the look-out returned about dark. This evening, (Monday the 23d) they moved me to another station in the same valley, and secured me as they did the preceding night. Thus I found myself the second night between two Indians, without fire or refreshment. During this night I was frequently asleep, notwithstanding my unpleasant situation, and as often dreamed of my arrival in Pittsburgh. Early on the morning of the 24th a flock of mocking birds and robins hovered over us, as we lay in our uncomfortable bed; and sung, and said, at least to my imagination, that I was to get up and go off. As soon as day broke, one of the Indians went off again to watch the trail, as on the preceding day, and he who was left to take care of me, appeared to be sleeping. When I perceived this, I lay still and began to snore, as though asleep; and he fell asleep.